Amazon has officially opened a shipping center in Sydney, the second one in Australia, as the US retailer leads the local market towards development. It was only May when Amazon Australia started working in its second distribution center in the south-western suburb of Moorebank in Sydney. Within a few months, the warehouse began to function and officially opened its doors to business. With 43,000 square feet of indoor space, the Sydney distribution center is almost double that of Melbourne, making it easy for the online market to deliver on the promise of fast delivery times, especially for Amazon Prime members. The company says it is expanding its office network as Australia expands to meet customer demand, increases product selection and supports more third-party Marketplace vendors with Amazon Logistics. The online retailer based in the United States UU. He says he will start recruiting immediately for a variety of functions, including operations, support and technical specialists. The facility is located at the Goodman Centenary Distribution Center in Moorebank, with easy access to the M5 and M7 motorways. Amazon opened its first shipping center in Australia in Dandenong South in December 2017. The online retailer launched a local website in December, which increased digital competition for consumer dollars among brick and mortar retailers. Since its launch at the end of last year, Amazon has introduced a number of new products and services, including Alexa, Amazon Echo, Amazon Music Unlimited and Amazon’s Fulfillment. 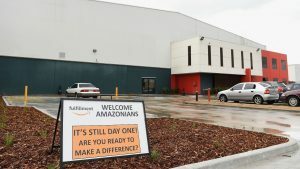 Australian sellers took advantage of Amazon’s logistics operations to collect, pack and ship their products directly from the company’s shipping center, where the new warehouse, together with the existing Melbourne center, enters the scene. In January, Alexa, Amazon’s digital voice assistant, arrived in Australia with a local accent. And in February, Amazon launched delivery for third-party vendors through the Amazon Marketplace, Fulfillment. The latest research by Morgan Stanley shows that prices on Amazon are significantly cheaper than those of major Australian retailers for many products. The Prime is already in Australia, a subscription that offers free deliveries locally at the end of this year. Consumer electronics retailer JB Hi-Fi has already lowered its full-year profit forecast, citing “difficult conditions in the home appliance market”. “This new facility builds on the capabilities of our first center in Dandenong South, allowing us to continue to fulfill our commitment to fast and reliable deliveries for Australian customers,” says Robert Bruce, director of operations Amazon Australia. The new Sydney distribution center, together with the existing building in Melbourne, will allow Amazon to handle current and future customer demand and accelerate delivery to customers across the country and is scheduled to begin operations in the second half of the year, 2018. Amazon was launched in Australia at the end of last year and offers tens of millions of articles in 23 different categories, including consumer electronics, books, sporting goods, fashion and Amazon devices. Are there any competing retailers? Yes! Given Amazon’s popularity in other international markets, local online retailers and markets in Australia needed to step up their game if they wanted to compete with Amazon. In an effort to compete with Amazon, the eBay online auction site has recently launched its eBay Plus subscription service in Australia, which offers subscribers free shipping and return of eligible products. It is similar to Amazon Prime, which has a very aggressive price in Australia for only $59 a year, half the cost of service in the United States. With eBay Plus, which is only available in Germany and Australia at this time, has an annual fee of $49. However, Amazon’s Prime service includes other benefits such as free access to Prime Video and Prime Reading. Donald Trump is claiming that Amazon is ripping off the US “Post Office”. Is it true?